Misery Index: Which will be the most miserable economies in 2019? Home > Blog > Which will be the most miserable economies in 2019? What is the misery index? The misery index is an economic indicator calculated by simply adding the unemployment rate to the inflation rate. Despite its rather simple calculation, it is useful in determining how the average citizen in a given country is doing, as higher rates of unemployment and inflation are associated with increased socioeconomic issues for a country. The misery index, originally created by Arthur Okun, a member of the Council of Economic Advisers to U.S. President Lyndon B. Johnson, was invented in the 1970s while he worked at the Brookings Institution. The misery index is often trotted out during times of economic turmoil and Okun’s invention was certainly timed to perfection in that regard. During the 1970s, the U.S. as well as much of the rest of the world was suffering from both high inflation and high unemployment, which came to be called “stag-flation”. This was largely caused by OPEC’s rise to power and subsequent oil shipment boycott to the U.S. and other western nations in retaliation for their assistance to Israel during the Yom Kippur War. This situation caused oil prices to skyrocket and economic growth to slow while the stock market crashed. Although the misery index usually appears in times of economic turmoil, the global economy is doing pretty well at the moment. We forecast global growth at 2.9% in 2019. However, we’ve brought out the misery index anyway to see which economies will be moving toward misery and happiness in 2019. Contrary to most lists, the misery index is a list where economies want to be as far from the top as possible. And speaking of the top, any way you slice it, Venezuela is going to be the most miserable economy in 2019. With inflation projected to come in at over 6,000,000% in 2019, their unemployment level is largely irrelevant for our calculations of their misery. Venezuela’s economic woes have plagued them for years now with sluggish oil prices having played a large part in the country’s demise, as crude oil is the country’s only significant export. Venezuela’s situation doesn’t look like it will be changing any time soon, as macroeconomic imbalances, unorthodox policies, surging inflation and a lack of investment are expected to keep Venezuela in a severe economic crisis for the foreseeable future. Although no country comes anywhere near Venezuela’s score on the misery index scale, Zimbabwe and Argentina come in as the second and third most miserable countries in 2019. In Zimbabwe, unemployment is the main concern with a projected rate of close to 80% for 2019. This number may be skewed depending on how unemployment is counted. Thailand is often near the very bottom of the list due in large part to their rather unorthodox way of counting employment as well as their low fertility rate and aging population. Much of Zimbabwe's population works in the "informal economy" which includes people working unpaid for a family business or paid emplpyees who are not entitled to sick leave or paid holidays. These people are not counted as employed. In Argentina monetary authorities continue to attempt to curtail the stubbornly high inflation rate, although with little success. In Iran, economic sanctions from the U.S. continue to fuel inflation. In Bosnia and Herzegovina, the main culprit is unemployment; however, the number of unemployed fell throughout Q4 2018, pointing to a strengthening labor market in 2019. In the two African giants, Nigeria and South Africa, the unemployment rate contributes most to their Misery Index score. In Nigeria, unemployment has surged to 23.1% in Q3 2018 from 9.0% since 2015. Although inflation has been trending downwards since early 2016, it has remained persistently above the Central Bank’s target range of 6.0%–9.0%. In South Africa, while unemployment is projected to stay near 27% for the next five years, inflation touched a 10-month low in January on slowing fuel costs. FocusEconomics analysts project that inflation will remain within the SARB’s target range over the forecast horizon. Moreover, they see inflation averaging 5.0% in 2019 and 5.2% in 2020. In war torn Yemen, the situation continues to spiral out of control. The economy has been torn to shreds by the civil war, which has caused agricultural and hydrocarbon production to screech to a halt and fiscal revenues to plummet, while a cholera epidemic has spread rapidly. In Kosovo, high unemployment plagues the country with large numbers of young people leaving in search of a better life in EU member countries. Some have pinned the high unemploment rate on nepotism, crime, corruption, which has led to decreased foreign investment and many young people to move abroad. In Turkey, the economic crisis has seen higher levels of both inflation and unemployment. The economy seems set to remain fragile this year as restrictive financial conditions dent domestic demand. 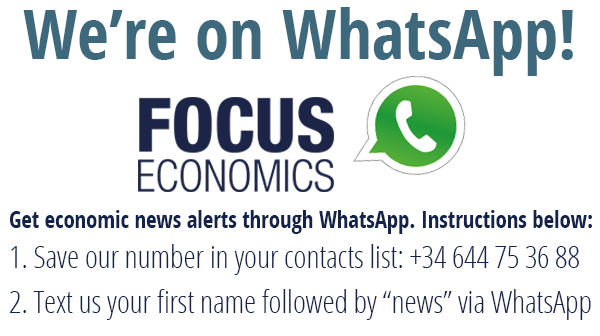 Nevertheless, a recovery in H2 is likely according to FocusEconomics analysts. If you'd like more forecasts and analysis of over 130 countries and 30 commodities, download a sample report by clicking on the button below. 5-year economic forecasts on 30+ economic indicators for over 130 countries & 30 commodities.